Develop professional skills and get valuable sustainability education to enhance your current career, prepare you for your next venture and change your life at home. We offer one of the few permaculture design training that match the schedule and tuition to the busy lives of urban professionals and full-time students. Gather at 6:30 to connect and share food, seeds, tubers, etc. 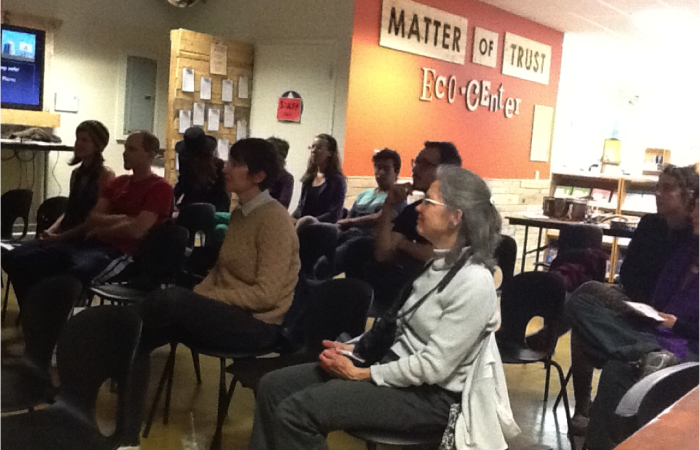 And from 7:00 pm to 9:30 pm we will circle up and learn, report, explore and conspire around all things permaculture in SF. On June 4th, we will be discussing our spring into summer and hold an open sharing of all the urban ag and permaculture projects happening this summer. New gardens are being started, old gardens being revived, cob oven projects, placemaking in Oakland, village building in Sebastapol, farm concerts, and intentional community open houses. Hundreds of permaculture designers and enthusiasts have come to the SF guild gatherings over the years — come prepared to be inspired! Permaculture is the development of agricultural ecosystems intended to be sustainable and self-sufficient. Over 50% of the world’s population now live in urban centers and the number is growing. Adopting strategies to meet our needs in a sane and ethical way is critical. Through a mix of classroom discussions, small group work, and hands-on activities, this course explores methods of designing and establishing regenerative communities and economies. The training offers the opportunity to develop professional skills, provides valuable education to enhance your current vocation, and inspire solutions that you can implement in your life. It is also a great way to connect with like-minded individuals. Our permaculture training course is one of the few that match the schedule to the busy lives of urban professionals and full-time students. The class is taught in San Francisco and we work on designs that can be implemented locally. We start with the standardized Permaculture curriculum and add onto it insights and strategies for applying Permaculture to the urban setting (we do not omit any of the standard materials). This lengthens the course to a degree. We participate in several permaculture projects here in San Francisco and around the Bay Area, observing and interacting with Permaculture principles in practice. Participants will also work in teams to produce a design for an actual project here in San Francisco. Throughout the course, we will share with you the tools and strategies required to complete the project. The class culminates in a final presentation. Join us and help build a healthy and happy community based on a common vision of harmony with nature and each other. We offer work trade and payment plans when needed, please see the Links & Information section of this page for more details. If for any reason you are not able to pay for the course in part or in full and cannot work, please contact us and we will do our best to make accommodations. We have recently added an additional 10–20 hours of purely hands-on instruction to the training to develop skills for implementing strategies learned in the classroom or in the discussion. Classes will resume in the fall of 2018.